While there is no one safe, natural method that is 100 percent foolproof in getting bugs and grasshoppers to stop eating your plants, an integrated pest management system will go a long way in allowing you to gain the upper hand over these pests. With this system, a gardener uses several different methods that, when put together, minimize the damage that insects cause. Grow seedlings indoors until their leaves are sturdy and are able to withstand an insect attack. Plant flowers and crops after insects make their first hungry attack in spring after they emerge from dormancy or hatch from eggs. Some vegetables, such as radishes, are flexible in their planting times. Hatching times vary depending on the year's climate and your location; check online or with a local agriculture extension office for hatching times of specific insects. Use different spots in your planting bed each year for different vegetables or herbs. Insects may overwinter in a spot where they fed the previous year. Place empty, 4-inch flower pots near flowers and vegetables that bugs are eating to provide shelter for toads and frogs which feed on insects. Provide water near the pots if none is available nearby. Hang a birdhouse near the garden. Birds will stay and eat insects even if you also put out bird seed or suet. Plant shrubs and trees near the garden to encourage birds to nest in the area. Lay copper strips around garden beds and pots. Slugs and snails will not cross these strips. 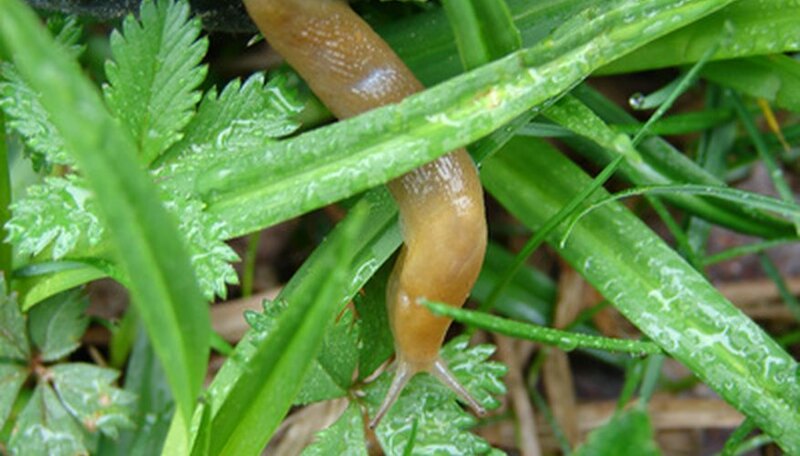 Spread diatomaceous earth, eggshells or nut hulls in your garden to discourage slugs and snails. Set paper cups into the ground around young seedlings with a 1-inch collar above and below ground to deter cutworms. Measure 2 inches down from the lip of the cup and cut. Push the resulting ring 1 inch into the soil around the seedling, leaving 1 inch above soil level. The cup size doesn't matter, but ensure that no leaves from the seedling touch the ground outside the cup perimeter. Spread tarpaper mats around plants to deter root maggots. For new transplants, cut holes into the tarpaper and plant through the holes. Spread a sticky pest barrier sold in nurseries and garden stores around the base of plants like rhododendrons to keep crawling insects from reaching the leaves. Place rolled newspaper, laid horizontally, around the garden to trap earwigs. Gather the paper once a week to dispose of the bugs. Cover crops with screening or floating row covers to prevent infestation by grasshoppers. Handpick bugs from plants and dispose of them. Do this early in the morning and at dusk to find slugs and snails. Handpicking is particularly effective against grasshoppers. Wash aphids and spider mites off plants with a strong blast of water from your garden hose. Do this as frequently as needed. Spray infested plants with commercially purchased insect soap to rid the plants of aphids, earwigs, sawflies, leaf miners, spider mites and thrips. These sprays are prepared in ways that do not harm plants. Spray plants with organic poisons or chemical poisons as a last resort when bugs are at their peak or when all other methods have failed. For grasshoppers, use products containing diazinon, dibrom or carbaryl. Plant tall grass near your garden as a hiding place for grasshoppers; this will keep them out of your crops and allow you to handpick them more easily.